We reached the house of Linda's niece on Saturday just south of Ogden. 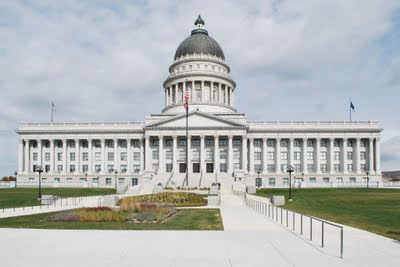 On Sunday morning, we drove down to Salt Lake City to see the highlights of the city and to add a photo of the Utah Capitol to our collection. That's me pointing to a brass bee on one of the beehives near the steps. 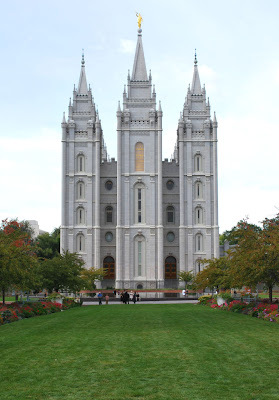 Another part of downtown that is a "must see" is Temple Square. Only a few blocks down the hill, it is a beautiful area. The LDS Salt Lake Temple dominates the square. Constructed over a forty-year span beginning in 1853 it is a very impressive building. Here are a couple of architectural details. Numerous building of religious significance surround the square. 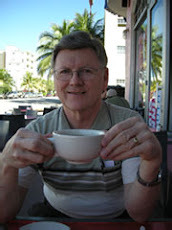 I had spent a few days at the Utah hotel in 1986 attending an IBM computer user group meeting. 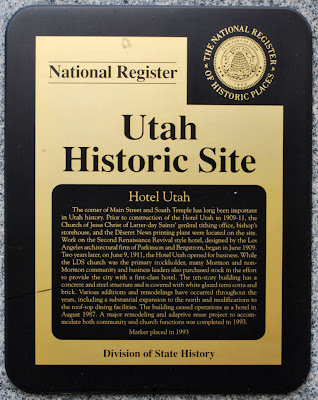 The Utah is now a Church Administration Building and all that remains is this sign. We had parked at the Visitor Center across from the Capitol and found very useful help there for seeing the highlights of the city. The walk down from the Capitol is much, much easier than the walk back up. Salt Lake City looks flat on the map but rivals San Francisco as a walking challenge.